Starting as a coverband and playing the Songs of Hendrix, Moore, Clapton & Co., the Tobacco Road Blues Band began writing their own material after being asked to perform on a Television Show. Since it was a Christmas Special this first song was a Christmas-blues called „Under the Christmas Tree“. The audience liked it and it subsequently got airplay on Austrian radio stations. After that the band toured their home country. Frequently, specially at smaller venues, Prammerdorfer and Diwald picked up there acoustic guitars and played their shows „unplugged“ as a duo. After playing like 30 gigs in 2017 songwriters Prammerdorfer/Diwald had accumulated numerous new musical ideas and all of a sudden 14 new songs had been written to be added to the concert set list for 2018. And of course these songs now are in the process of being recorded with the release date set for November 2018. The single „Lean Your Head On Me“ to this upcoming CD was released in March 2018 and soon found airplay on various stations. Watch out everybody in LjubJana. In April Barna Pely's comin to Ljubjana. This night is about a smashing blues guitar, energetic vocal, and mind-blowing stomp bass. Performing his own english and hungarian songs and a few covers that made an effect on his singer-songwriter career or musical attitude he always stay energetic on stage and never forget about his audience. Great show! Don't miss it! V sodelovanju s Balassijevim inštitutom - Kulturnim centrom Veleposlaništva Madžarske v Ljubljani. David Jarh je slovenski publiki že dolga leta poznan trobentač. Je tudi član RTV Big Banda in profesor na KGBL Ljubljana. V svoji karijeri je že nanizal veliko tako avtorskih kot ostalih projektov. Tokrat bo predstavil mladega obetavnega vibrafonista Aleksandra Severja. Vabljeni..
Skalp so skupina, ki je v svojem skoraj dvajsetletnem ustvarjanju požela veliko strokovnih nagrad, kar jih je nedvomno utrdilo na slovenski rockovski sceni. Njihov pristop do ustvarjanja je instinktiven in hkrati nabit s strastjo do prvinskega rokenrola. Besedila so inteligentna, a vsebujejo ravno pravo mero kljubovanja in praktičnega pristopa do življenja. V letu 2007 so fantje izdali svoj prvi album Preproste rešitve s katerega je kar 6 singlov zasedlo prva mesta radijskih lestvic, leta 2012 pa je bil izdan drugi album Mars je prodan z nosilno skladbo Vem, da lahko!, ki je prejela tudi nagrado za najboljši videospot leta. Z albumom Mars je prodan na slavnostni podelitvi iz rok župana Ajdovščine prejeli tudi nagrado za posebne dosežke. Fantje pa ne počivajo na lovorikah in trenutno v studiu Hendrix snemajo nove skladbe. 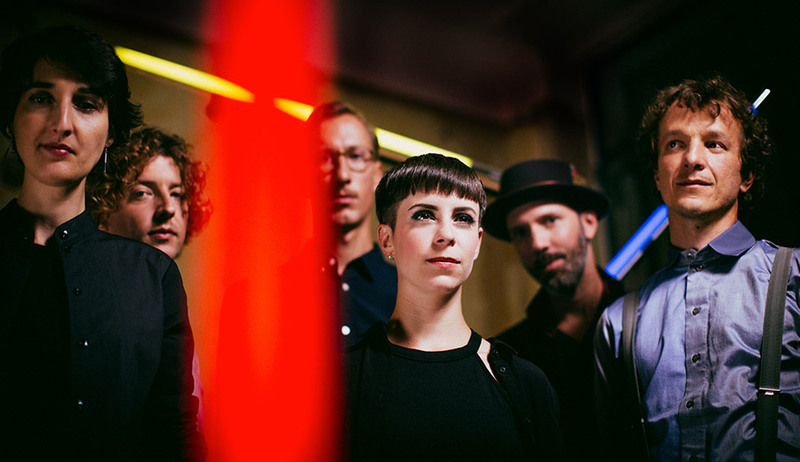 The heavier the world feels on your shoulders, the more you need a light and dainty beat to move to.With Steady As She Goes, Berlin-based band Holler My Dear are releasing a disco-folk album that works the current gloomy state of affairs into bouncy tunes. To hi-hats, trumpets and accordeon, the six eclecticists are dancing gently on the filter bubble all while being staunchly political; play acoustically all while retaining their disco groove. Seeming contradictions is also where the album’s nautical title stems from: Steady As She Goes, or „keeping the ship on course“ is less about going in straight lines and more about navigating high tides: It’s fluctuation Holler My Dear find consistency in. V sodelovanju s Ausrtijskim kulturnim forumom - Kulturnim centrom Veleposlaništva Avstrije v Ljubljani. Sound Dealer was founded in 2010 by Armin Polsinger, David Kinzer and Gabe Cresnar. The musicians were all active in the Austrian music scene for years. But each of the three longed for a project that combined the energy and playfulness of progressive rock music from the 1970s with more modern, harder sounds as well as groovy and jazz-heavy elements.